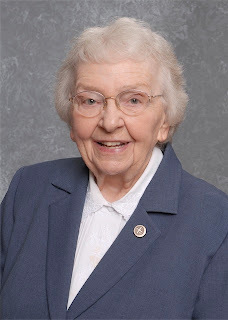 Patricia Kelley, SCN, 89, a native of Lexington, Ky., died at Nazareth Home on Tuesday, April 24, 2012. She had been a Sister of Charity of Nazareth for 71 years. Sister Pat served in elementary education and as music teacher at Holy Name School in Louisville, from 1942-47; in elementary education at St. Thomas More School, Louisville, from 1947-52. Sister Patricia was then sent to Gaya, Bihar in India where she served in elementary education. Later at Mokama, Bihar, Sister was Formation Director and Director of Junior Professed for the SCN Congregation. Sister Patricia returned to the United States in July 1977 and served both in this country and in Belize, Central America, in active ministry until she went to Nazareth Home in August 2011. Survivors include devoted nieces and her religious community.